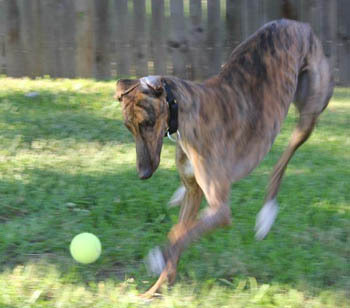 Babette, aka Run to Morning, is a 3-year-old brindle female born August 17, 2009. Her sire is Gable Diego and her dam is Lisa Foronda. 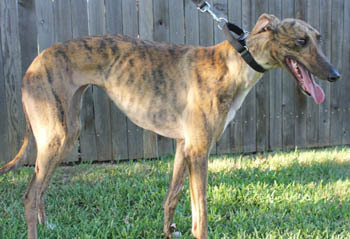 Babette has 56 races to her credit on Greyhound-Data.com, all at Gulf Greyhound Park starting March 9, 2011. Babette's career ended on April 30, 2012 with a torn plantar ligament. 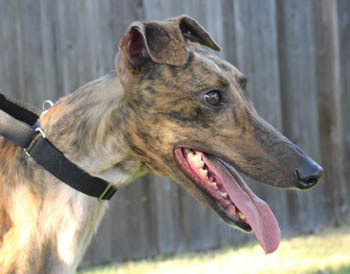 She underwent surgery with Dr. Stephen Kerpsack of Central Texas Veterniary Specialty Hospital on May 8, 2012. A bone graft was used with a 6 hole 2.7mm plate along the calcaneus/4th tarsal bone with placement by 4 screws. 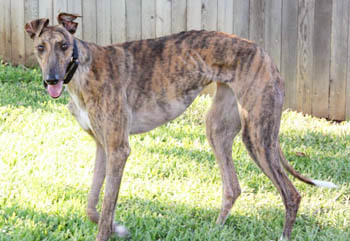 Babette stayed in a fiberglass splint for 8 weeks while she healed, with weekly bandage changes. She has normal function in her injured leg, however, the plate may need to be removed in the future if it starts causing problems. Come meet Babette! Babette has passed her initial cat test.